304 polished stainless steel mirror finish. 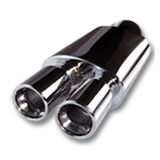 Straight trough stainless steel core tube increases exhaust flow & performance. Oval & round styles with & without tips. Universal designs for greater coverage. A complete line of stainless steel tips. High polished finish for maximum style.